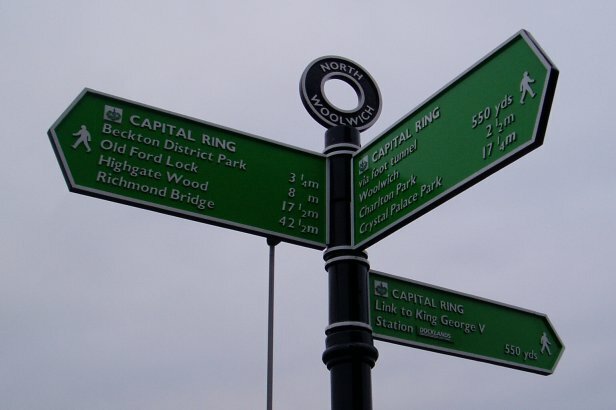 I walked this, the 15th and final stage of the Capital Ring on the 27th December 2006. The stage is quite short and runs from Beckton District Park down to the Thames and then along to the Woolwich foot tunnel at North Woolwich. The Capital Ring runs round the edge of Beckton District Park South, photo 1, and makes its way between houses to Beckton New Park. From Beckton New Park the route then takes a footpath that runs between a modern housing estate down to the Cyprus Docklands Light Railway station. Passing the front of the station the Capital Ring runs along Cyprus Place before taking a path off to the right, opposite the Ferndale pub, which leads to the Gallions Roundabout, surrounded by a mix of open space and the buildings of the University of East London. Making my way around the roundabout I came to a sign on the far side near the Gallions Reach station that said "The riverside route is currently unavailable. Please follow the alternative route avoiding steps", photo 2. Rather than head down to the Thames from Gallions Reach the alternative route runs alongside the A112 Woolwich Manor Way. This runs besides the Gallions Point Marina and passes over the Sir Steve Redgrave bridge which crosses over the Royal Albert Dock. 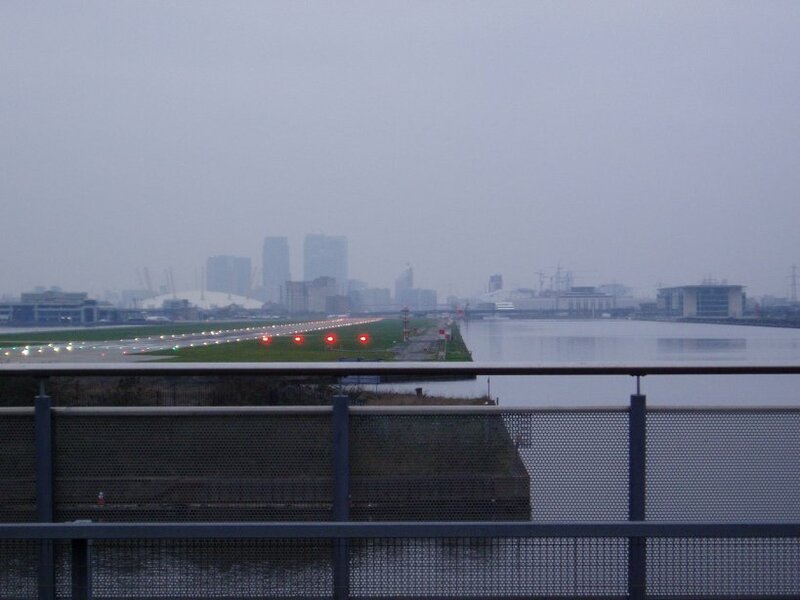 To the right there were good views across the docks and over the runways of London City Airport towards the Millennium Dome and the tall buildings of Canary Wharf, photo 3, although it was a very gloomy and misty afternoon. Leaving the bridge the route passes the vast lock gates of the King George V Dock at Gallions Reach, photo 4. A little further on this alternative route of the Capital ring leaves the Woolwich Manor Way and heads past Grimsby Grove and Fishguard Way to reach the River Thames at Gallions Point, passing between the flats in photo 5. Photo 6 was taken looking down the Thames from Gallions Point. From Gallions Point the path rejoins the original route and turns right to head upstream along the Thames Embankment. The path follows the Thames round the front of the houses before turning right to cross over a slipway that leads down into the River some distance below. Unbelievably a couple had driven their car down the narrow slipway right to the very waters edge which seemed an utterly pointless as well as dangerous thing to do. As I watched they slowly reversed back up the ramp. The route then takes a narrow path besides the River that runs into the Royal Victoria Gardens. To the left a Woolwich ferry, photo 7, was slowly making its way back and forth across the River, its safety announcements clearly audible across the water. Passing through the park alongside the Thames the route heads along one final section of riverside path towards the slip road down to the Woolwich Ferry. Here the path leaves the River embankment and turns right to reach the North entrance of the Woolwich Foot Tunnel, photo 8, from where I had started my walk round the Capital Ring in a thunderstorm way back in May 2005. Now it was Walk Over. The GPS made the distance between Beckton District Park and the entrance of the Woolwich Foot tunnel just 2.4 miles. The route would be longer when it is possible to walk along the riverside from Gallions Reach. From the foot tunnel I walked over to the King George V Docklands light railway station to begin my journey home. This gave a total mileage walked for the day of 12.9 miles although my feet ached so much it seemed like considerably further. On the way to the station I noticed that the old North Woolwich Rail station which I had used to reach the area when I started my walk round the Capital Ring has now been closed, another sign of the rapidly changing nature of this area.